UNITED NATIONS, September 14 -- On Darfur, the UN refuses to say if it has moved to change its practice of waiting for government approval before even trying to protect civilians, and the UN Mission UNAMID refuses to answer Press questions. Inner City Press on September 14 asked Secretary General Ban Ki-moon's spokesman Martin Nesirky if Ban supports the re-entry of Justice and Equality Movement leader Khalil Ibrahim into Darfur from Libya, and if the UN has asked for permission to so transport Ibrahim. Video here, from Minute 13:30. Since then, no information has been provided, and Inner City Press' questions, about UN inaction on the killings in the Tabarat Market, have not been answered by UNAMID. Inner City Press on September 14 asked Nesirky. Nesirky, seeming to not want to answer himself, said that asking UNAMID directly sounded like “not a bad idea.” But UNAMID won't answer. Nesirky said he'd find out. On September 9, Inner City Press asked Ban about UNAMID's failure to protect civilians in the Tarabat Market. 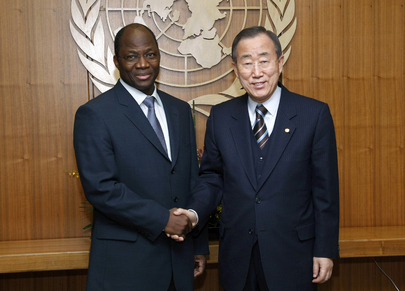 Ban replied that he had summoned UNAMID chief Ibrahim Gambari to his retreat in Austria. But what was said? 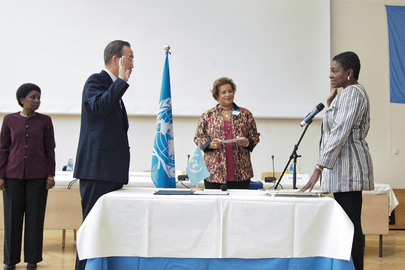 Is there an UN response to JEM's request that Gambari resign for failure to protect civilians? Nesirky said he would check, presumably on both.. We will be here. Footnote: Mr. Ban held a press conference on September 13, but Inner City Press was not granted permission to ask a question, and no questions were asked about Sudan, despite Ban's claims about the UN's work there in his opening remarks. We will continue to follow these issues. UNITED NATIONS, September 9 -- In Darfur a week ago, UN Peacekeepers refused a request by the relatives of those killed and injured by janjaweed in the Tabarat Market to go to the location and try to protect those injured. Inner City Press obtained and published an internal document of the joint UN-African Union Mission in Darfur, UNAMID, which said that approval had to be sought before the peacekeepers could go even to a site where injured people were dying. UN Secretary General Ban Ki-moon held a brief media availability on September 9, and Inner City Press asked him about the Tarabat Market killings, the restrictions on movement on UNAMID, and the failure of the other UN Mission in Sudan, UNMIS, to view the body of killed Darfuri student Mohamed Musa when they were told of his death on February 12 of this year. Mr. Ban acknowledged problems in obtaining the “support” of the Sudanese government, and said that he summoned UNAMID chief Ibrahim Gambari to his recent retreat in Austria to discuss these and other problems. The Justice and Equality Movement rebels in Darfur have demanded Gambari's resignation for failure to protect civilians. While Ban's candor was surprising to some, to characterize the UN's decision to await approvals before endeavoring to protect civilians as a problem of “administrative support” from the Sudanese authorities misses the point. A billion dollars are being spent on each mission, UNAMID and UNMIS. They have armed peacekeepers, armored personnel carriers, and helicopters which they have allowed Sudan to block them from using. Since these restrictions violate the status of forces agreements the UN has with Sudan, it is unclear why the UN -- or mission chiefs Gambari and Haile Menkerios -- accept the restrictions. 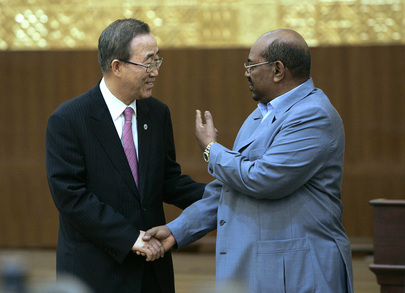 Both went to the inauguration of Omar Al Bashir, indicted by the International Criminal Court for war crimes and genocide. Menkerios, the UN has admitted to Inner City Press, simply wants to return to New York in a year's time. He rarely speaks to the press in Sudan. He doesn't want to rock the boat. Inner City Press: It turns out that, despite the protection of civilians mandate of UNAMID, that in several recent instances, peacekeepers have been telling relatives of victims that they need to get approval before they can leave their bases to go out. Most recently it was at the Tabarat market in Jebel Marra. They told them that they had to get approval before they could go. By the time they went, some people who had been injured were in fact dead. So what I am wondering is, what is the policy of the UN in terms of seeking approval from the Government? There is also a case in Khartoum in which a dead Darfuri student that was allegedly tortured, UNMIS (UN Mission in Sudan) was unable to get access to his body until it was too late. So, what is the policy of the UN in terms of its freedom of movement to protect civilians in Sudan? SG Ban Ki-moon: In some cases it is true that there was some difficulty in getting smooth administrative support from the Government of Sudan. That has been the subject of continuous consultation with the Sudanese Government. During my visit to Austria last week I called in Mr. [Ibrahim] Gambari to Vienna, and I got a briefing on the situation and how we can ensure a smoother and more effective coordination and support from the Sudanese Government. We are aware of such problems and we will continue to improve the situation. Inner City Press: Does it violate the Status of Forces Agreement, that the UN hasn’t been to parts of Jebel Marra since February? That is what John Holmes said before he left, that there are whole regions of Darfur they haven’t been able to reach. SG Ban Ki-moon: There is a Status of [Forces] Agreement, of course. They should be faithful to provide the necessary support and cooperation. In reality, when we are not able to get such support, it really constrains the movement of our people and peacekeepers. We will do our best to improve this situation.